By Raphaella da Silva, M.D., Tony Abraham, D.O. 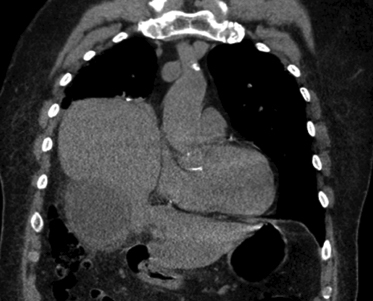 An 89-year-old man with a medical history significant for hypertension presented to the emergency department with fever (101°F), dyspnea, and leukocytosis with left shift. 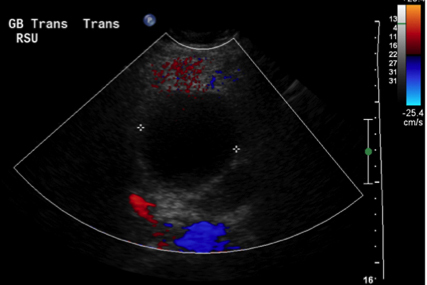 Noncontrast chest computed tomography (CT) showed marked gallbladder wall thickening and distention with pericholecystic fat stranding, suggestive of acute cholecystitis within a large, chronic right diaphragmatic hernia (A). Subsequent abdominal sonogram showed a hydropic, thin-walled, fluid-filled gallbladder with dependent sludge, but no calculi (B). Sonographic Murphy sign was negative. 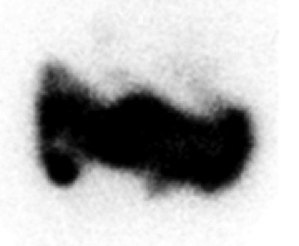 The patient was subsequently referred for a hepatobiliary radionuclide scan to evaluate for acute cholecystitis. Following intravenous administration of 5.3mCi Tc-99m labeled BRIDA (bromo-2,4,6-trimethylacetanilido iminodiacetic acid), dynamic images of the anterior abdomen were obtained out to 1 hour. Static images were performed at 1 and 2 hours postinjection. 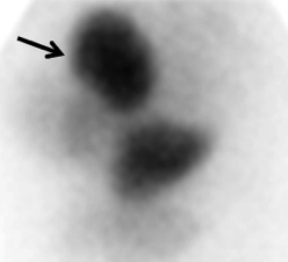 Prompt and homogeneous radiotracer distribution was seen in a bilobar liver (C) with the right lobe herniating through a known diaphragmatic hernia (arrow). 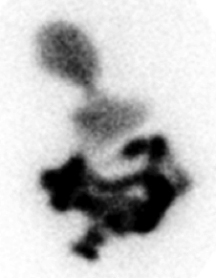 Appropriate biliary-to-bowel transit was noted (D). The gallbladder was not visualized on dynamic or delayed imaging (E), consistent with cystic duct obstruction and suggestive of acute cholecystitis. Acute acalculous cholecystitis is uncommon but can be life-threatening. Cholescintigraphy sensitivity for acute acalculous cholecystitis is lower than that for acute calculous cholecystitis (80% vs. 95-98%). Ziessman HA, O’Malley JP and Thrall JH. Chapter 8: Hepatobiliary System. In: The Requisites: Nuclear Medicine, 4th ed. Philadelphia: Elsevier; 2014:141-142.
da Silva R, Abraham T . At the Viewbox: Acute Acalculous Cholecystitis on Hepatobiliary Scan. J Am Osteopath Coll Radiol. 2015;4(4):25. Raphaella da Silva, M.D., Tony Abraham, D.O. Dr. da Silva and Dr. Abraham work with the Division of Nuclear Medicine, Montefiore Medical Center, New York, NY.